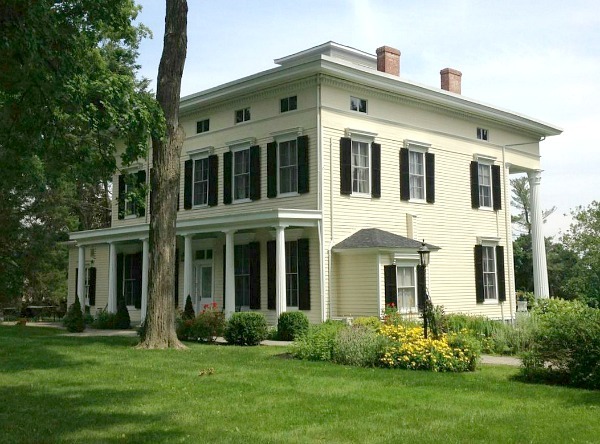 A reader named Nancy wrote me about Saxton Hall, her wonderful old house in Cornwall-on-Hudson, New York. 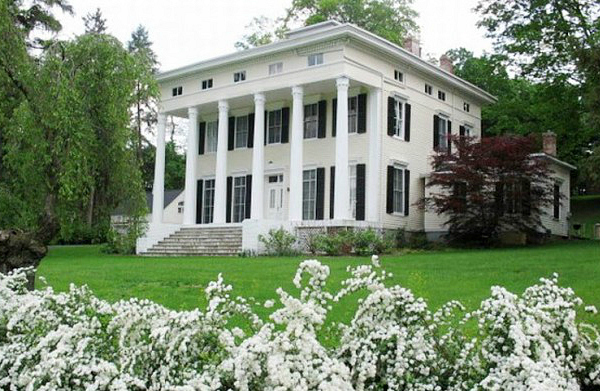 It’s a Greek Revival dating back to the 1830s, and they were determined to restore it to its original beauty. 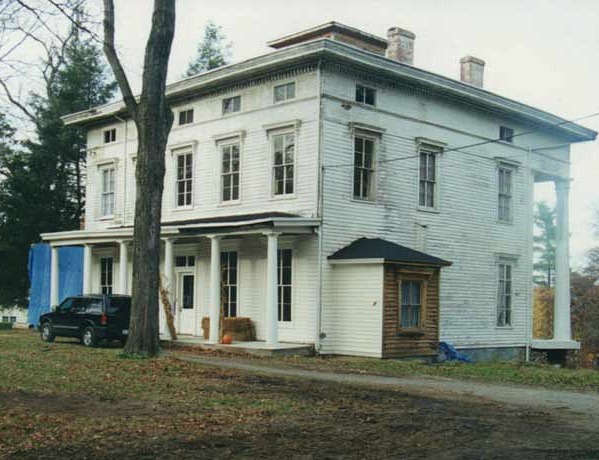 When she and her husband bought it, “It was in a complete state of disrepair.” But this house story has a happy ending. Keep scrolling to see how it looks today! 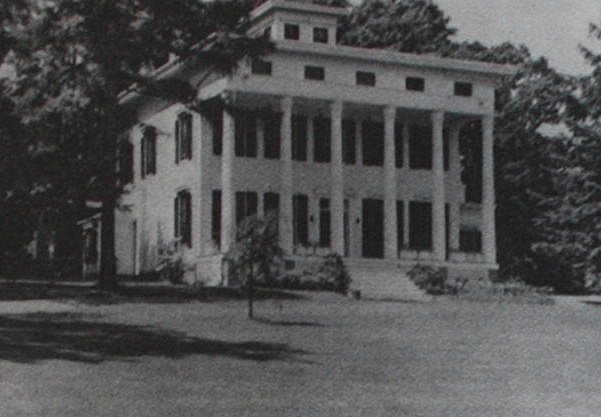 The house was renovated in the late 1930s by Harvey Deuell, who was managing editor of the New York Daily News, and his wife Peggy Hull Deuell, who made history as the first woman war correspondent in WWI. It looks about a million times happier today, though, doesn’t it? 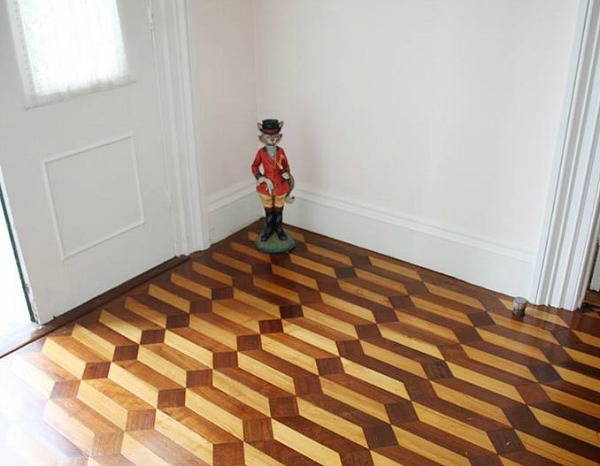 The ornate inlaid wood floor in the center hallway was once in such bad shape you could barely see the pattern. 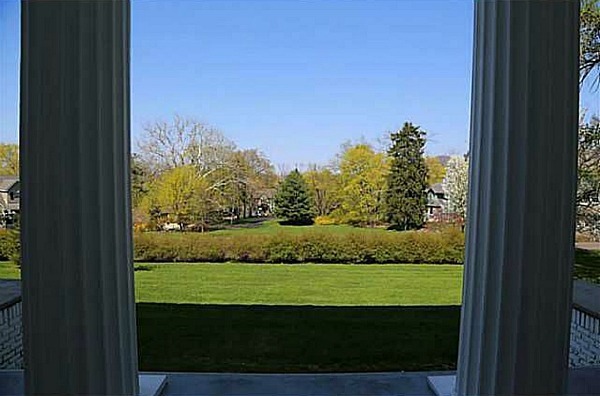 At least two dozen window panes were cracked when they bought the house. The house has 4,615 square feet with 6 bedrooms and 3.5 baths. I read that when Peggy Hull lived here, she spent a lot of time writing in the cupola. I can see why! that gave you splinters when you walked barefoot.” Yikes. 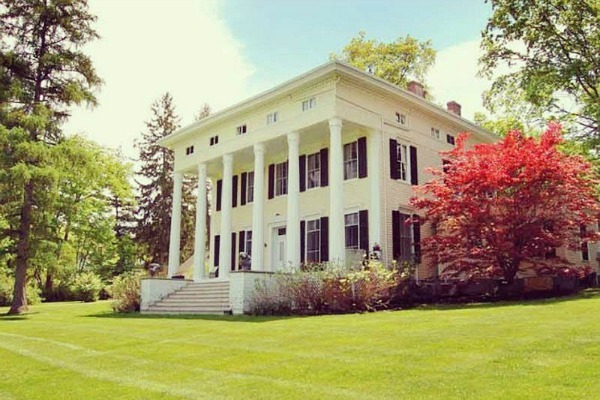 “Best Places to Live in the Hudson Valley” by Hudson Valley Magazine. It’s undergone quite a transformation since then. Many thanks to Nancy for sharing the story of her house with us! They’ve put it on the market for $799,000. For more photos and information, check the listing and the Saxton Hall Facebook page. Wow! 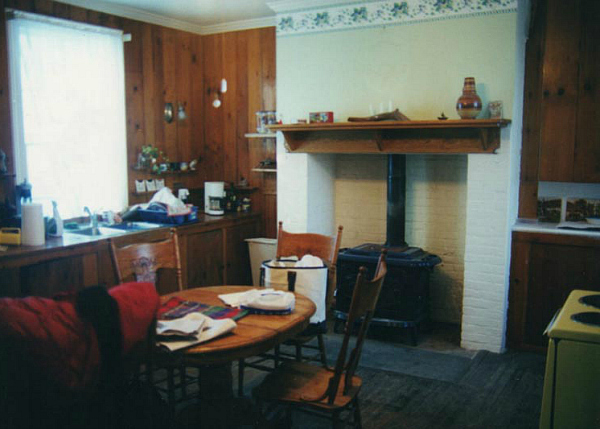 Just looking at the ‘before’ pictures of the kitchen, it’s like….where do you even begin? I can see how it could have been very overwhelming (and depressing) very quickly, but the owners made it happen. I hope their home is blessed with happiness and laughter always. They’ve earned it! Gorgeous!!! Stunning!!! I love everything about it. 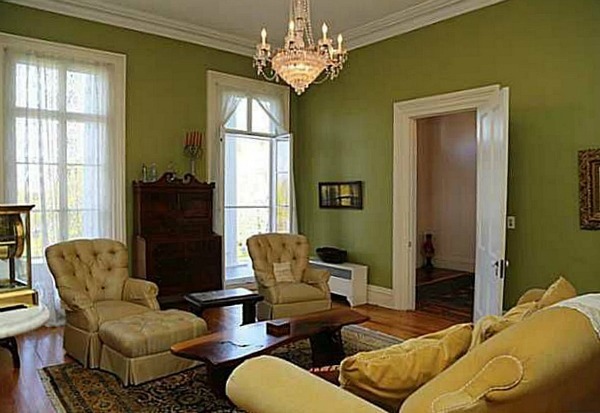 Well done renovation and best of luck to the sellers – I’m sure it will be snapped up quickly. What a wonderful old home! 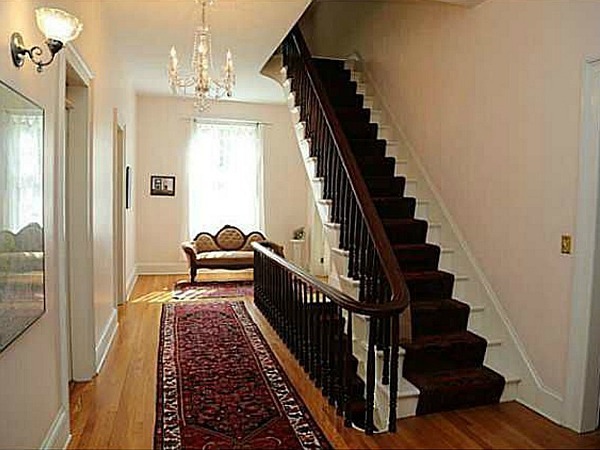 These homeowners have restored it to its former grandeur and done so with grace and respect. 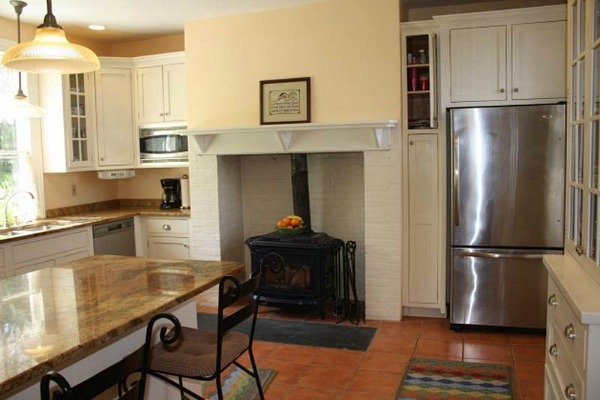 I love the inlaid flooring and woodstove in the kitchen! 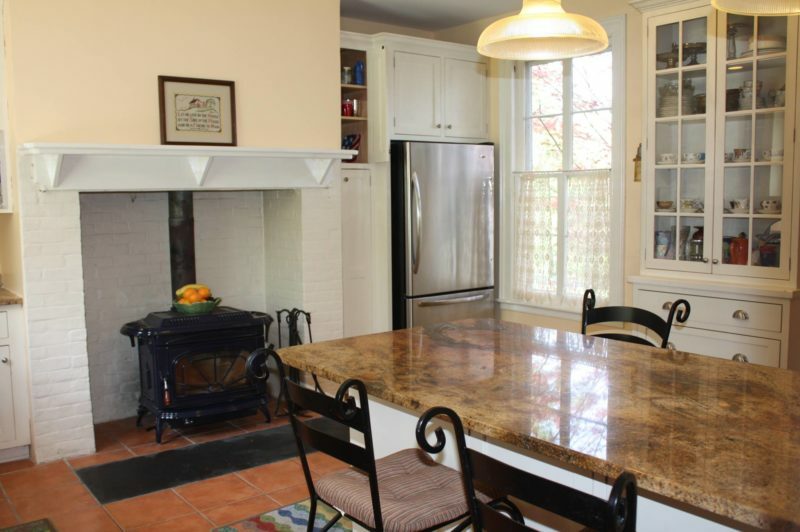 Actually, there are too many things about this property that I love, to list them all. To summarize in one word….FABULOUS. Wow. This one sure is amazing. Loved it! Fantastic! Looks like a happy house for sure. 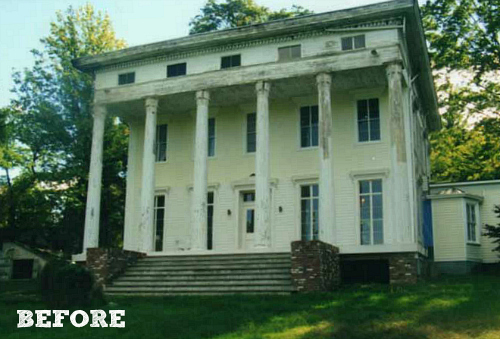 Love to see people tackle a project like this and restore a beautiful property back to it’s former glory. 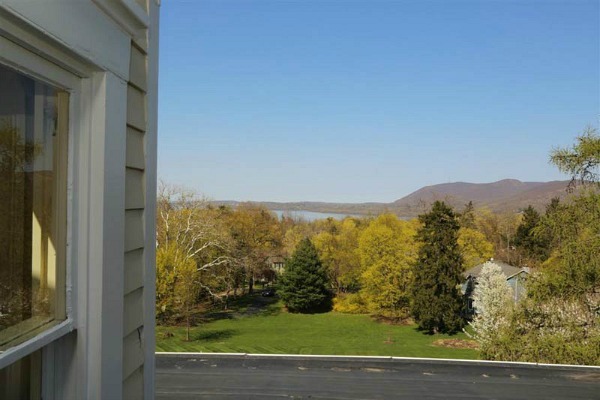 Considering the location, size of lot and restoration, the price seems kind of low. Oh, this renovation is simply gorgeous! 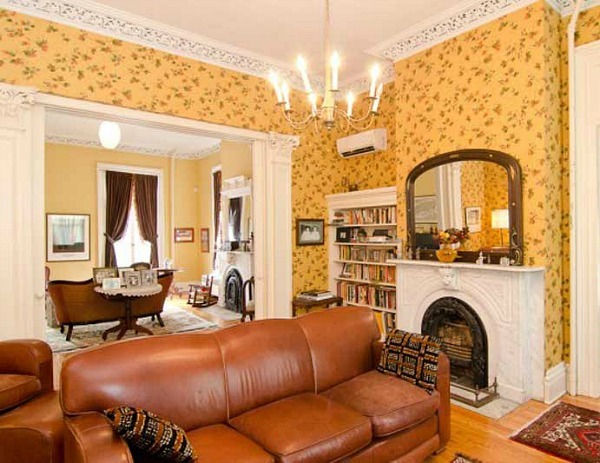 A touch of Southern Louisiana in New York… Perfect! You had me at cupola! Incredible transformation! Kudos to the owners for keeping the character of the home. So many beautiful restorations to ‘ooh and aah’ over. 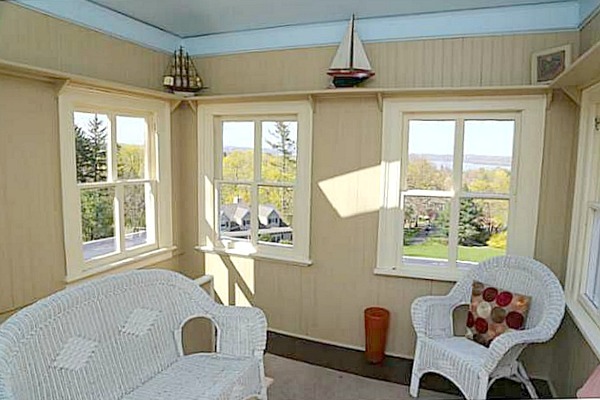 I would immediately claim the cupola as my reading nook. 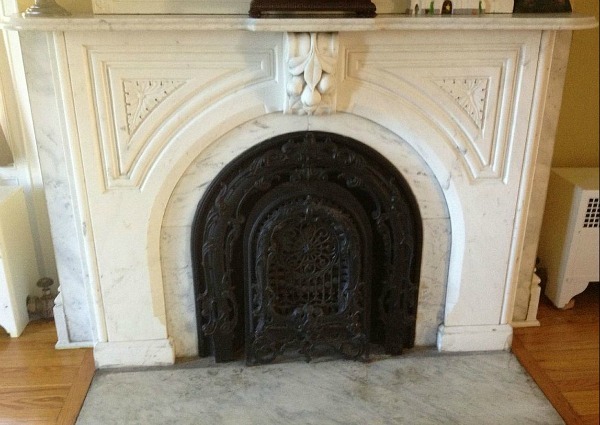 Those fireplaces are stunning! Thanks for sharing, Julia! 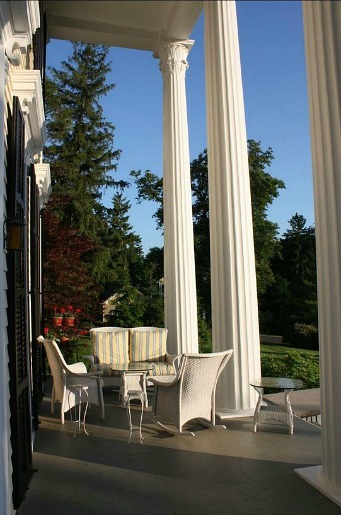 Those columns…swoon! What a beautiful home! I truly gasped when I saw those hardwood floors. what an amazing job the homeowners did. GORGEOUS!!! I did, too, Jen. Those floors are incredible! What a fantastic restoration. They took a house that many would have torn down and brought it back to what it should look like. It looks like it was always loved and cared for. The part I love most is it looks “right” not new pretending to look old or over-the-top elegant. Just a beautiful home. This is EXTRAORDINARY! My jaw dropped many times while seeing this! Wow! Have a wonderful day, sweetie. Wow. Such an impressive transformation! I’m so thankful that there are people in the world with the vision and stamina that it takes to pull something like this off. Bravo! Ah-mazing! A beauty saved and restored..hip hip hooray for Nancy. I can’t fathom how such incredible, rich houses fall into such neglect…what is the backstory to this one? 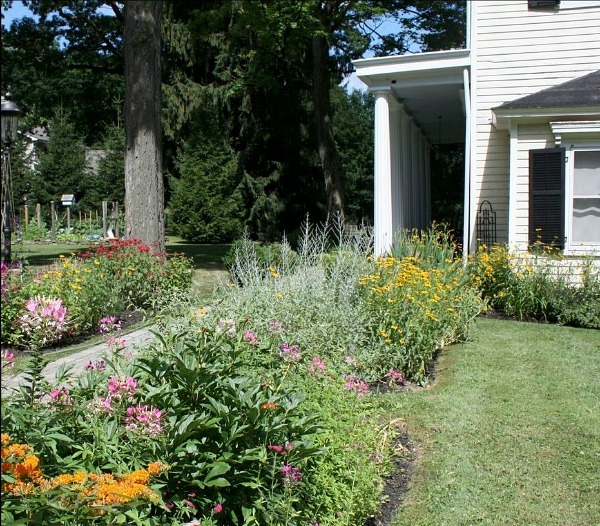 Maybe, another Gray Gardens situation? Well, at least it is saved and shining again. Wow, they did an awesome job! That old picture you restored is amazing. That has got to be framed and put up somewhere in that house. That’s a cool idea. 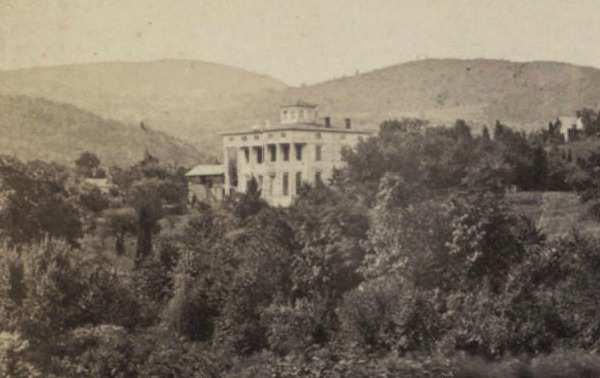 I just love old photographs of houses like that! Wow! You can tell they worked really hard to honor the history of their home. 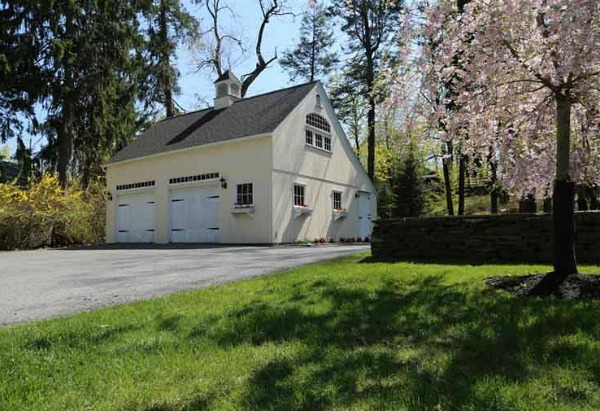 Even the garage/barn looks amazingly appropriate. Every old house should be so lucky to have such thoughtful renovators. Wow, that house is gorgeous and what a magnificent job they have done of the restoration. Stunning! Sounds like I need to find a book on her now, if there is one. 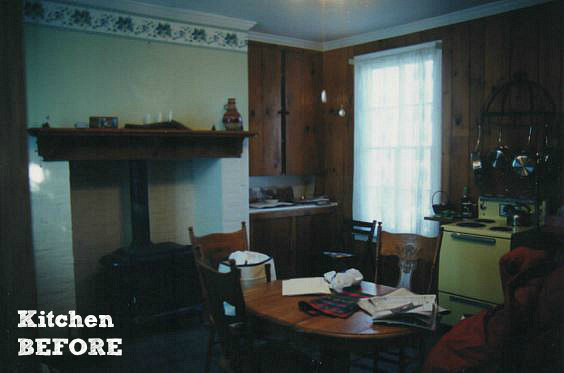 One of the things I always think about with old houses is how much history was going on in the world…this was years before the U.S. Civil War even, when this house was brand new…this house was built years before ELECTRICITY…no power tools built this house, just skilled hands of craftsmen. I mean, we humans will come and go, die off, but these houses (if lucky) will keep on “living” for a long time. It is with that thinking I especially appreciate those who respect and restore the houses & buildings. If this was a house torn down and then a McMansion put up then look how much is forever lost. Thanks for the link, Tammy! What a wonderful restoration! Such love and care (and expense, I’m certain) went into that home. I was seriously expecting a much, much higher price. Absolutely wonderful! I love these posts. I think it’s so important that people save the beautiful and historic homes. Amazing! Love the exterior and grounds, the interior is beautiful. The kitchen to die for. The price is unreal for all that. They did an incredible job. Good luck with the sale. Absolutely spectacular! But, here’s the rub: the taxes on this beauty are almost 23,000 dollars a year! Ah, taxes. They’re always the rub, aren’t they? Ha. Thanks, Suzy. WOW!! That was truly a pleasure to see! What an amazing transformation that is obviously a labor of love! I may have missed it somewhere along the way, but how long did this transformation take from the time she began renovations to completion? 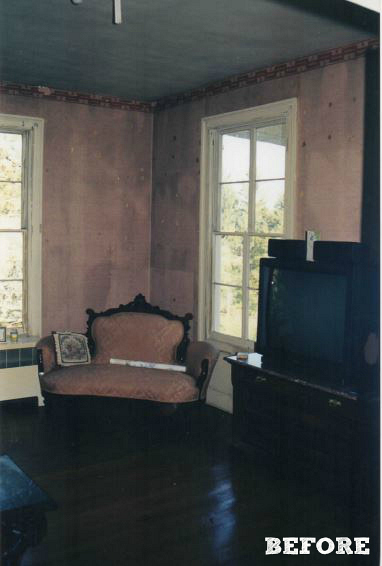 This restoration was done with such respect and honor to the house. You can see all the love they put into it. Thank you for sharing. Thanks for sharing this w/ us Julia; it’s just gorgeous! That whole area has some wonderful old homes. Absolutely stunning restoration. Thanks to the owners for saving this beauty. I love the blend of tradition with comfort. The rooms look inviitng – like you would want to hang out there. Not museum-like. Great job! It exudes happiness. Very stunning! And yes, I too love those floors. Beautiful renovation. The amount of debris removed, not a surprise from a house that size. We just finished gutting our house the previous summer and it’s not nearly that size. L.o.t.s. of garbage. What a fascinating legacy that home has had! What space in the house is associated to those small windows near the eaves? I looked through the images to see if there were any in the background of some of the 2nd story shots but I didn’t spot any. that is my same question! i kept looking for an explanation in text or a clue in a picture… and i’m checking the real estate listing and fb page for the house too and nothing so far. Maybe it has something to do with ventilation? Considering it’s age, maybe it was a way of cooling the second floor by allowing air to circulate. It doesn’t look like that space is high enough to walk around in comfortably. It is perplexing. The smaller windows are for the 3rd floor. The floor is not as shallow it it appears. The roof is hipped but the design is to make it appear flat and unnoticed from the ground. That floor could be used for storage, kids play rooms, or servants rooms. 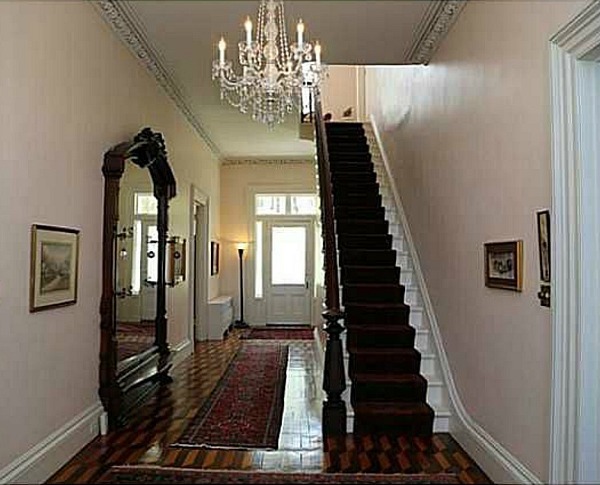 The house can appear grand without becoming top heavy with a top floor appearing like a main floor. As for ventilation, that is the purpose of the belvedere on top. It actually acts like air-conditioning for the house as it creates a draft removing the hot air. Interesting! Thanks for explaining that, Ken! Thanks for the explanation. It makes sense now, especially the possible uses you point out. I still want interior pics of them! Gorgeous. Stunning. Impressive. Thanks for sharing your house, Nancy! Beautiful renovation both inside and outside! I’d spend so much time in that cupola! Amazing renovation! I love everything about it. So did Mr. Peabody and Sherman use the way back machine to rescue the place? Great house and the taxes oh my, but chuck’s house in Portland had a similar value to tax bill ratio. Remarkable house, and remarkable people, who put so much love into bringing a gorgeous old house back to life. Hoping that whoever is fortunate enough to own it next has a close extended family and lots of friends. 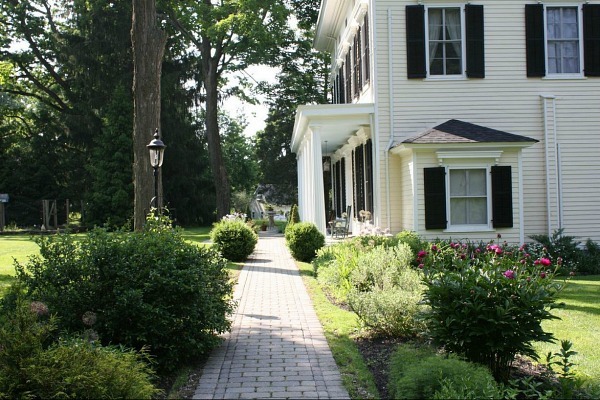 It looks like a perfect family home place where several generations could gather. I simply cannot stop staring at these house photos! 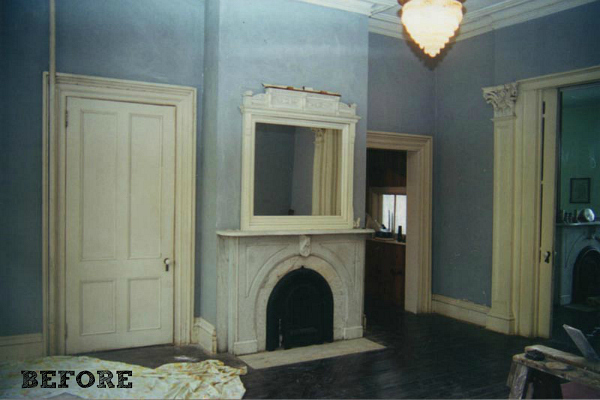 Bravo to the homeowners for an amazing restoration. It makes me happy when people rescue houses like this. Beautiful! That house must be so happy! It’s so refreshing to see a good quality restoration. I do old house consulting and makeovers and the ideas most homeowners and architects have are scary! They mean well but just don’t understand historic architecture and are under the influence of modern day builders and advertisements. 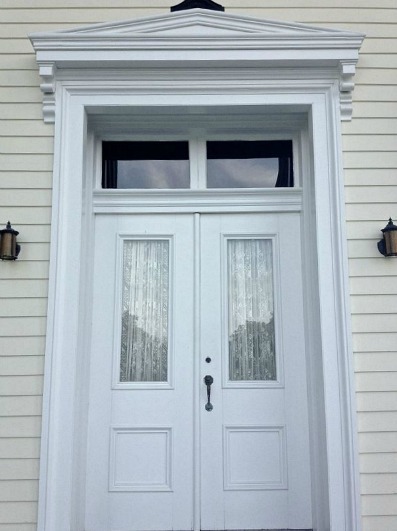 They think they can add ornamentation anywhere on their house and it becomes Victorian. Congrats to a homeowner for a job well done! It would be interesting to know what the purchase price was and how much money went into it. Wonderful restoration. Such a beautiful house…the owners did it proud. Seems like a bargain, with all the money they must have put into it! And anything on the Hudson is just so pretty. I don’t think you can do anything more important in life, other than raising children, than to rescue an old house. Kudos. I could not bear to sell it, though. What a jaw-dropping transformation!!!! 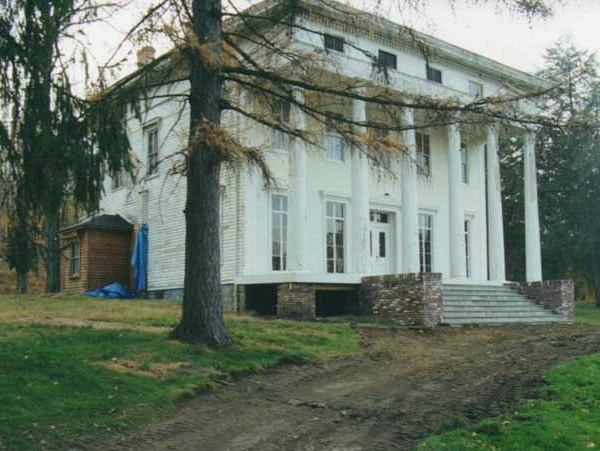 Bravo Nancy for undertaking such a daunting yet rewarding restoration. Hi Julia this home looks so majestic and inside absolutely breathtaking. What I don’t understand is you go through all that renovating and then you put it on the market. I watch the English Grand Designs they go though so much because they do it from the heart and to let go after all that Ouch…. I couldn’t do it. Thank you for sharing this beauty, must go back and admire some more. Regards Esther from Sydney. PS hope you have a great weekend. Beautiful restoration. Hooray for the folks who did it! And hooray for you for posting this story. This is what keeps me coming back. It just makes my day. I can’t say anything that hasn’t already been said but did want to chime in. It’s a beautiful home in a beautiful setting. I hope it finds the right owner. 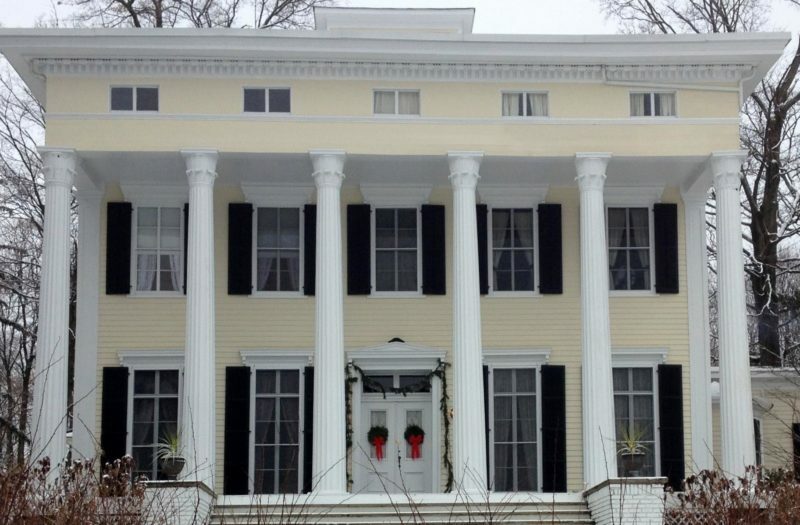 Greek Revival is my absolute favorite architectural style, and upstate New York seems to be a prime place to find this style. I love this restoration. Absolutely stunning. WOW, that is beautiful!!! Great job!!! The kitchen kind of reminds me of the movie Baby Boom which I know you’ve profiled. I love the updated kitchen but it just shows how we have stretched our ideas of updating and renovating from earlier decades. 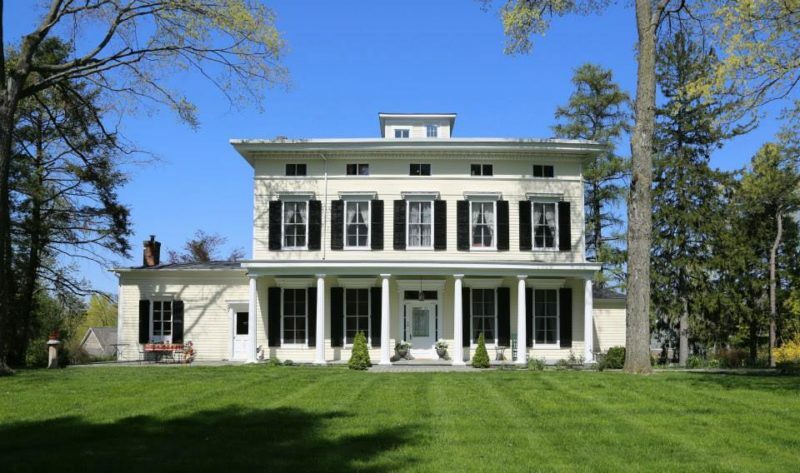 The exterior reminds me a lot of President James Monroe’s home near Monticello. I wonder if they were built around the same time. Hey that’s a thought, what about doing a series on President’s homes? Do you think if I find myself in the area they’d let me hang out on that porch for a few hours?! Oh, the books I could read there! AMAZING. I’m in awe at the courage and foresight it took to take on this project and how absolutely magnificent it turned out.